Title: 01/19/2000 - Responsible party for MSDSs and labelling of imported chemicals. Thank you for your letter of June 28, 1999 to the Occupational Safety and Health Administration (OSHA), concerning Material Safety Data Sheets (MSDSs). You asked if your client can list its name on an MSDS instead of listing the Japanese manufacturer from whom it imported the product. We apologize for this delay in response. The Hazard Communication Standard (HCS), 29 CFR 1910.1200, allows downstream users to add or substitute their name on the labels and MSDSs of hazardous chemicals. However, if the downstream user substitutes its name, thereby removing the original manufacturer's name, it becomes the responsible party for insuring the accuracy of the hazard information. The responsible party must be able to supply additional information on the hazardous chemical and appropriate emergency procedures, and would be subject to citation if there were any deficiencies on the MSDSs or labels. When chemicals are imported into the United States, the person (meaning one or more individuals, partnerships, associations, corporations, business trusts, legal representatives, or any organized group of persons) who imported the product automatically becomes the responsible party. OSHA only has jurisdiction over transactions which affect commerce within the United States. As the importer is the first point of contact within this country, the importer is therefore responsible for complying with the HCS; the HCS requires that the importer include their name on the MSDS and label. 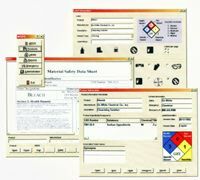 Keep on top of your hazardous chemicals with MSDS Administrator software from Safety Emporium. We trust that the above information answers your question. Please feel free to contact the Office of Health Compliance Assistance at 202-693-2190 if you have additional questions.